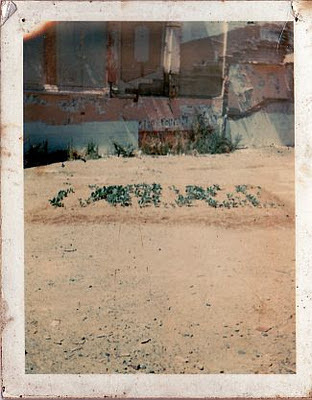 Thomas might have had other reasons beside the desire not to be arrested for describing his artwork, entitled ‘Vacant Lot Of Cabbages’, as a harmless, non-radical act, misdirection being the most obvious one. 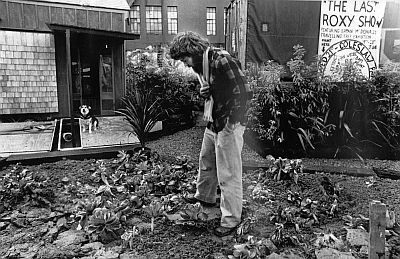 The medium he had chosen – compost and cabbage seedlings – was hardly likely to warrant jail time after all, and the piece cannily but nonetheless gently invited the passer-by to reflect on alternative uses of the land, as opposed to inciting a take-over by violent means. But there was genius in that seemingly timid opening, too, for it didn’t foreclose the meanings that the lot – now that it had been successfully trespassed – could take on if others cared to add to that impromptu art-show. And add to it they did. 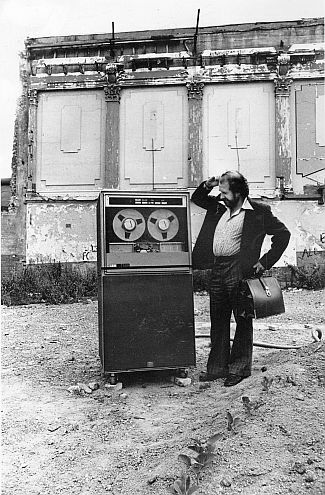 First came the top half of a tricycle, painted in fluorescent pink by George Rose, hung on a wall at six metres of height and tethered to the cabbage patch by means of a trail of paint; then an IBM 7330 magnetic tape unit, which was deposited next to the patch and ‘plugged’ into it; then a scarecrow-waiter with a cabbage for a head; then a living room suite complete with sofa, armchairs and a television set; then a grave with the ‘corpse’ only half-buried. And this just in the first two weeks. During this time the absentee site owner, Mr Konstanich, went from cheerful to irritated, first wishing Mr Thomas a bumper crop, then lamenting that all of the intrusions and dumping of stuff on the property would hinder his efforts to develop it and put it to proper use. On this point, some necessary context, in the form of the two years that elapsed from the demolition of the Roxy Theatre andthe Duke of Edinburgh Hotel to the planting of the cabbages, and a string of newspaper articles and council queries and owner reassurances on the always seemingly imminent future of that empty space in the heart of the business district, at once an eyesore and a source of anxiety for the economic well-being of the city. 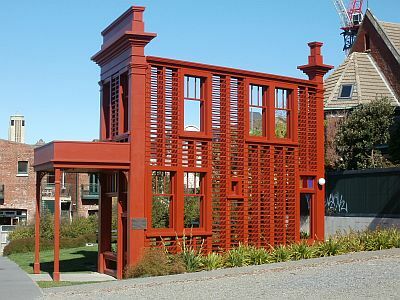 The Tinakori branch of the Values Party had repeatedly petitioned the City Council to allow them to establish a temporary park on the site, only to be told that this would necessitate the owner’s authorisation, which wasn’t forthcoming. And so what it took to break the stalemate was an act of trespassing defused by humour, an artist’s statement calculated to buy time. Six months is how much time it bought: six months during which a delimited section of the city remained open to intervention and reinvention. Some citizens might have been puzzled by some of the hardware that appeared next to the patch, but by all accounts they continued to look after the cabbages, and it was the cabbages themselves that dictated how long the show would run, for it would have been senseless to let them wilt. Reports indicate that by harvesting time the Roxy had gone mainstream, attracting sponsorships and money from the Central Regional Arts Council, and helping the Commission for the Environment in turn to ‘promote public interest in trees’. To this end a ‘tree house’ cottage on wheels designed by architect Ian Athfield was built, initially drawn by Clydesdale horses from Rutherford House to the Roxy site, and later taken by Arbor Promotions on a tour of the North Island to sell native trees (or so it was planned). By this stage Mr Konstanich also appeared to have realised that the activities weren’t going to hurt his chances to profit from the property. 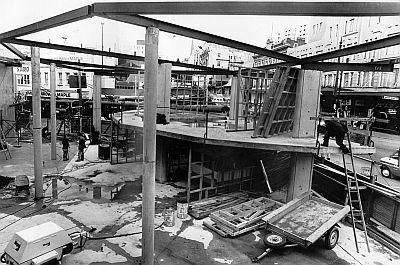 None of this however is to detract from the project, which is remembered by many people who lived through it as an important moment in the political and artistic life of the city. Of Thomas’ piece itself, Chris Trotter has written that it was ‘a conceptual artistic statement against the life-negating conservatism of the Muldoon years’, while Ian Wedde celebrated it as a 'work about ecology' that was also 'about public attitudes to art'; but what grew around the cabbage patch – chiefly in the forms of opportunities for expression – seems to have been just as important, and included more overt political speeches and works a papier-mâché pig with Muldoon’s face and the lines ‘Media Media expose the pig / Time to stop dancing to his jig’ scribbled on the back, installed by a ‘women’s action group’. Then work started on the new building, erasing every trace of all that work. 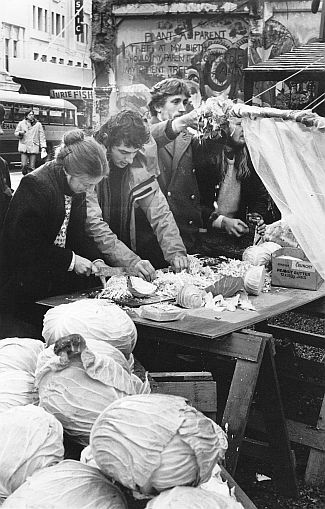 Art and political activism are accustomed to dealing with their own precarity, but the issues raised in relation to the Cabbage Patch are in some respects unique and, I think, significant from the point of view of current practice. First of all, there is the question of how to preserve the memory of the work: where is the archive, where are the curators that will ensure that information about events projects such as this one are available to scholars, reporters, artists and activists? The documentation concerning the Cabbage Patch is not kept at Te Papa (it may be worth speculating as to why) or by any of Wellington’s universities, and for this post I have relied almost exclusively on Barry Thomas’ own archive and recollections. But personal networks and the efforts of individuals aren’t enough: sites of institutional memory are fundamental to preserve the genealogy of socio-political criticism and activism. There is a very plausible genealogy here, one that connects the movement against the extension of the motorway through Thorndon to the one against the Inner City bypass through Te Aro, but also the Springbok Tour protests and the Cuba Street Carnival, and the cabbage patch is likely linked in some way to all of them. Just as significant are the severed connections, for instance between the Cabbage Patch and Tao Wells’ Beneficiary’s Office – two works with much in common but sealed off from one another due to the lack of access to past local practice as a meaningful resource. Then there is the implicit but no less stark contrast with the art that actively robs us of our memory. Meet Regan Gentry’s Subject to Change, a work ‘commissioned by Wellington Sculpture Trust to commemorate the Wellington Inner City Bypass Project’ and ‘sponsored by NZ Transport Agency and Wellington City Council’ (as per the plaque; the emphasis is mine). This spit in the face of the wishes of the community, caught by Gentry in mid-air, is without doubt Wellington’s most galling publicly funded sculpture, and arguably the product of the same mindset that oversees the lack of institutional memory I have just described. A piece that is disdainful of its public, that instructs it to forget, to ‘get over’ the loss of heritage, paid for by the people who took a literal bulldozer to said heritage, representing both the death of irony and an utterly perverse use of the art form. We’d do well to remind ourselves that it is not all that Wellington is, and that the city has been the very opposite of that. This Saturday something is going to happen and the people who are going to make it happen will lay claim to the phrase ‘occupy Wellington’. My strong reservations towards the ‘we are the 99%’ rhetoric notwithstanding, I look forward to finding out what form the local movement will take, if it takes shape at all. But none of the foregoing is intended as a lesson from the city’s past that ought to be heeded, nor as a sort of nostalgic exemplar: more as a hopefully not wholly untimely reminder that Wellington has a history of acts of trespassing, and of using art to engage the wider public and to pose political questions. This knowledge may be about to become useful again. With many thanks to Barry Thomas for the conversations and giving me access to his archives, from which all of the images except for the penultimate one are taken. The Ian Wedde reference is from ‘Art’s Dirty Washing’, a review of the When Art Hits the Headlines show published in The Evening Post on January 20, 1988. Last week's post is a part one, of sorts, of this one. 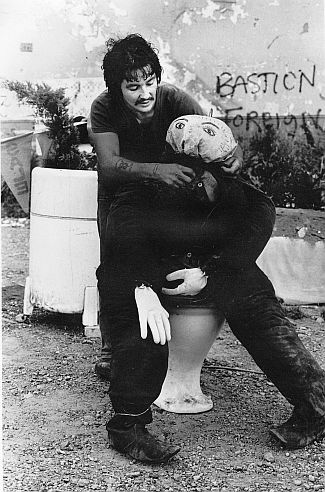 Since Giovanni's and Chris Trotter's writing on the Cabbage Patch (1978) Te Papa has purchased all of my archives on it. How wonderful. Here too are the 32 comments made about the Cabbage Patch on Giovanni's blog 'Occupy"
Seems to me you could plant a fair few cabbages in that patch of grass next to Subject To Change. Wow, I'd never heard about that, um, "action" or however you might phrase it. Really interesting read, thanks. Regarding preserving the record of what happened - I did wonder if the city archive (WCC) would have anything. Probably not. The NZ govt. has a long history of turning in crops. I used to go to work past the Cabbage Patch. 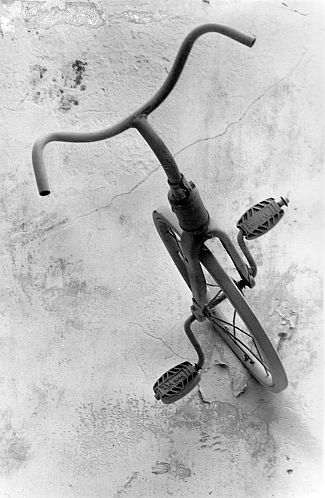 I remember the whispering that went around the bus when the trike first appeared. I don't remember the IBM. It was a great experience for a Wanganui boy to see art happening in front of me. I thought that they couldn't eat the cabbages because of lead content? Good lord! We contributed to that!! We half-buried a mannikin, with just the legs sticking out, where the old TV set and couch were positioned!! I seem to remember that the Cole Slaw Party which celebrated the harvest on site actually had to use commercially grown cabbages - because the ones grown on site were full of lead from car exhausts. No unleaded petrol in those days. I remember the old poxy Roxy continuous screenings theatre too. The fleapit that nobody missed. Great writing, I was lucky enough to catch a show of Barry's at Thistle Hall before staging "The Beneficiary's Office", where I reveled in documentation of his "cabbage patch". It is a great danger that works of this manner are not archived in our public institutions.. They are after all the very lines of fight established on behalf of "THE PUBLIC". I too have written about Gentry and the model he represents.. Funny that despite all the attention this empty lot received at the time, its fate was the same as that of its less glamorous neighbours. Fyi, the link to the Duke of Edinburgh hotel photo doesn't work any more. Looks like NLNZ links expire after a while. I'm delighted that people's memories have been rekindled... Excellent. Permanent occupation of the space was never the aim though. This was no Bastion Point (and it's worth remembering that the two events happened at the same time - the police and the army cleared Bastion Point on May 25, 1978, destroying the temporary building and a vegetable garden which was used for actual sustenance by the occupiers.) Thomas' "I'm not radical" line is probably best understood in that context. Looks like NLNZ links expire after a while. So they do! Which is kind of ironic, no? I'll fix the link, thanks for noticing that. I too have written about Gentry and the model he represents..
Flour Power is quite something. This is an artist whom we can factually call a fascist. What? Why would you call him a fascist? Great post. There's a vacant lot on Kelly St in Mt Eden - the site of a former ESR facility with a complex and slightly sordid history - and for a while in about 2009 the community round there built up a BYO psychedelic art garden. I remember Greek columns and day-glo trees, outdoor chess sets and the like. Because this was 2009 not 1978, the 'archive' is a facebook page. Sorry, bad link - try this instead. That is very interesting and of course raises archival questions as well - how long do we expect idle Facebook pages to be around? Yes, not very long at all is my understanding - and certainly not twenty years. 'Archive' only really applies in inverted commas... Difficult to say if anyone will have photos of Kelly St in 20 years. I think I might like Subject To Change, at least a bit. It presents a cursory facade over an unnecessary amount of purported infrastructure. It replaces three-dimensional real life with a two-dimensional counterfeit and then makes a point of telling us that we should be grateful. Sure, the 'official' narrative says things about Changes In The Landscape and Tenuous Existence, but since when is the official narrative the whole story? Then again, I don't have to live with it. "but since when is the official narrative the whole story?" Since the transport authority paid for the bloody thing. I think in fact it would be even more infuriating if the piece carried some subversive meaning, given who its sponsors are: you don't get to bulldoze your way through a community and then lament its passing. But I think Subject to Change does exactly what it says on the plaque: commemorate the bypass. And why we should memorialise a piece of newly built infrastructure remains profoundly mysterious to me. You dislike the idea of someone taking the transport authority's money and using it to criticise them? It seems like such a good idea to me, which I guess means that this is going to be one of those times when a big old hole in my understanding of the world is brought to light. I know it's not anyone else's responsibility to patch the hole, but if you could provide a google term or two to set me on track I'd be grateful. It's like that other memorial on One Tree Hill. "You dislike the idea of someone taking the transport authority's money and using it to criticise them?" It's not that I dislike it, it's that I don't think it's actually possible. Even if the piece disrupted the official, orderly narrative of the bypass (namely, that it was constructed following extensive consultation and with the support of the council and the stakeholders, and that it represents progress) it would still be a message brought to you by the New Zealand Transport Authority, which is to say the people who bought those properties and let them fall apart over the course of decades, biding their time until opposition was exhausted. And then they got to sponsor a nice monument. Given those kinds of relations, I don't see how Gentry could have produced a critical piece even if he had somehow been willing to. I really like James Loewen's line on markers and monuments - that they aren't necessarily a reliable source of information on their supposed subject, but they tend to tell quite a lot about the people who built them. Like I said, I don't live with the sculpture - I don't think I've even seen it in real life. It seems like there is some value in having a specific, ugly reminder that this road has a specific, ugly history, but if the people who actually interact with it in the course of their lives don't experience it that way then, well, they don't. If it was in my yard, I'd grow beans on it. Subject to change = "art that actively robs us of our memory." Gentry's "molars" in Dunedin harbour are just as ugly.He now has 3 ugly public works in 3 NZ cities- is he the next Neil dawson. Good to see some images of the cabbage patch. I tried to look this up a while back and there was next to nothing online. Especially sad considering how the 'cultural capital' now tends to celebrate temporary public art- see One Day Sculpture. Letting Space has been good though. When Barry Thomas commandeered a vacant lot on the corner of Willis and Manners Street to make a temporary public art statement in 1978, there was no thought given to it becoming a permanent part of the nation’s memory bank of art. Indeed it’s taken a long 34 years for the extant records of his cultural act of planting the vacant lot with 180 cabbages to be acquired by Te Papa for the national collection. "I can still remember that moment of cutting through a wire fence to this dormant and empty lot, waiting for a truckload of top soil to be delivered in broad daylight and planting the cabbages," says Thomas. "Seeding that soil with something organic brought an emancipated form of the quarter acre plot into the city. It laid a meme-like challenge to the complacency of the time. It was unexpected, and this created an unexpected set of responses - from people claiming and occupying the site as their own, through to it becoming a venue for a spontaneous arts festival and perhaps the first unintentional urban garden in the Southern hemisphere". Now that this anteceding act has been captured as an important moment in New Zealand’s art and social history, Thomas welcomes the creative emergence three decades later of more deliberative public artspace projects in New Zealand such as Letting Space, The Performance Arcade and Gap Filler, being celebrated at the City Gallery in Wellington on Saturday 3 November. "The deeply profound influences I was discovering in 1978 are still with me, lived out through concepts like my radical art advertisements in the pavement cracks of culture. Anything that can’t be confined by convention, or defined by an academic, or curated to death... that’s what matters. And that’s what a ‘Vacant lot of cabbages’ achieved".